Today, the Holy Father nominated Dominican Father Joseph Augustine Di Noia, 66, as the archbishop secretary of the Congregation for Divine Worship and the Disciple of the Sacraments. He is given the archepiscopal dignity and is assigned the Titular See of Oregon City. 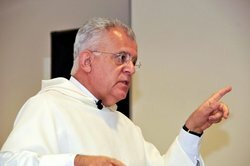 A native of New York, a professed member of the Order of Friars Preachers, DiNoia possesses an earned doctorate from Yale and he is an esteemed professor. He is the past editor of the Thomist (a journal of Theological research and opinion). Until now Archbishop-elect DiNoia was the under-secretary for the CDF. Archbishop-elect Joseph Augustine DiNoia, O.P. will be ordained to the episcopacy by His Eminence, William Cardinal Levada at the Basilica Shrine of the Immaculate Conception, Washington, DC on 11 July 2009. Blessings, my friend! May God grant you many years! Today we observe the 46th anniversary of the death of a great Father of the Church, Blessed John XXIII (known in history as Angelo Giuseppi Roncalli). Many will remember him as the "smiling pope". He was the pope of senior age who called the Second Vatican Council. In the course of time the Church has recognized this pope's holiness and he was declared a "blessed" by Pope John Paul II. Blessed John's liturgical memorial is observed on 11 October and he is the patron of papal delegations. Everyone remembers the image of Pope John's smiling face and two outstretched arms embracing the whole world. How many people were won over by his simplicity of heart, combined with a broad experience of people and things! The breath of newness he brought certainly did not concern doctrine, but rather the way to explain it; his style of speaking and acting was new, as was his friendly approach to ordinary people and to the powerful of the world. It was in this spirit that he called the Second Vatican Ecumenical Council, thereby turning a new page in the Church's history Christians heard themselves called to proclaim the Gospel with renewed courage and greater attentiveness to the "signs" of the times. The Council was a truly prophetic insight of this elderly Pontiff who, even amid many difficulties, opened a season of hope for Christians and for humanity. In the last moments of his earthly life, he entrusted his testament to the Church: "What counts the most in life is blessed Jesus Christ, his holy Church, his Gospel, truth and goodness"
God our Father, you reward all who believe in You. 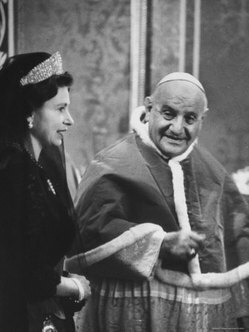 May Your servant, John XXIII, our Pope, vicar of Peter, and shepherd of Your Church, who faithfully administered the mysteries of Your forgiveness and love on earth, rejoice with You for ever in heaven. This page is a archive of entries in the Holy See category from June 2009. Holy See: May 2009 is the previous archive. 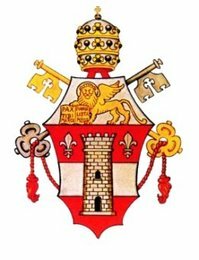 Holy See: July 2009 is the next archive.